The Camorra is the Neapolitan counterpart to the Sicilian Mafia. Its tentacles reach into and corrupt the work of every major institution, from local government, to the criminal justice system, to local businesses and communities in blighted urban neighbourhoods. 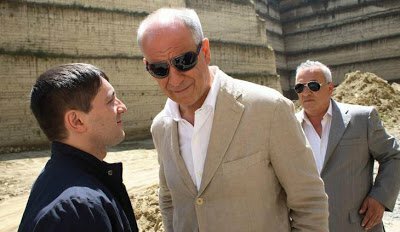 It is known to many outside of Italy through the film Gomorrah, based on a book of the same name, which focuses in on one particular crime syndicate within the mafia, the Casalesi clan, and their influence in Naples in the mid-200s. The Camorra's money is invested in major industries, on which it has an equally corrosive impact. It famously runs Naples’ notorious waste disposal service, which has indiscriminately mixed and dumped waste on the cheap with total indifference to the public health implications. According to a report in 2007 it also controls not just drug-trafficking and prostitution, but the fish and milk industries, the coffee trade and thousands of bakeries across the Campagna region. The distortionary impact of the Camorra’s intervention in these markets is symbolised in the film Gomorrah by the bloody retribution meted out to a rival business that undercuts its interests in the garment trade. The Camorra is not all-powerful. Its members who are caught and cannot be defended go to prison. It does not, could not and would not want to control everything that goes on in Naples, and many inhabitants lead perfectly happy lives there without ever crossing its path. Those who do however, whether unavoidably or through carelessness or bad luck, soon feel a net closing around them. The weapons at the Camorra’s disposal are varied and potent, making it a ferocious and resilient force. There is the ability to lean on those in power who have already been compromised, a slick legal machine that can create innocence out of the faintest shadow of doubt, and a code of silence which allows the whole to survive the loss of individual parts. Most spectacularly there is the implicit threat of unanswerable force. Violence is used sparingly, but once a decision is made it is indiscriminate and brutal. If a film were made about the same period in Britain, it would be about News International. Rupert Murdoch’s hold over British political and cultural life over the best part of three decades has been nothing short of mafia-like, as Anthony Barnett has argued. In fact, substitute physical violence for the metaphorical violence of character assassination and strategic political attack, replace omerta with the buying of silence, and they become hard to tell apart. This is not to imply moral equivalence between organised crime and the ruthless wielding of enormous media influence, but to highlight the same distortionary impact they have on the institutions of a democratic state. For starters, a generation of ambitious politicians have learnt to see the Murdoch empire as an additional pillar of British democracy, and have internalised the requirement to court his favour or at least avoid his disapproval. In Murdoch’s Britain not just MPs, but police, journalists and representatives of other key institutions, if they are in any way compromised (or even if not,) are censored or self-censor to avoid career and health threatening trial by tabloid. Of course politics and policing continue as normal in those areas that are not of interest to News International. But in those that do clear lines are drawn in the sand, and are rarely overstepped by those who matter. So what does the demise of the News of the World, and the possibility that News International may be further cut down to size mean for Britain’s Camorra? Although there is a long way to go there are positive signs that a single media group may never again be able to exercise such a stranglehold over democratic processes. This is less surprising than it currently feels. Organisations, even old and powerful ones, can suddenly collapse when the arithmetic of power shifts, whether through scandal and intrigue or the creative destruction of the market. (In this case the latter may be of equal importance to the former.) What changes far more slowly and less perceptibly is the social and cultural context within which organisations operate. On this front the picture is far less clear, but looking into the past may give some clues as to what the future may hold. It may help to see Murdoch’s rise as the most recent attempt over more than 150 years to unite, politicise and mobilise Britain’s diverse working classes. He has come closer to achieving this elusive dream than all the others who have tried, from the Luddites, though Keir Hardie and Oswald Mosley to Arthur Scargill. This is because Murdoch, unlike those other dreamers, did not seek to mobilise the masses in pursuit of an ideological programme - that is, as an end in itself. Rather the means of becoming an intermediary between the masses and the political elite was his end. On this point a subtler and arguably more interesting parallel with the Camorra arises. Although its roots are far older, the Camorra really grew to prominence following the failed continent-wide revolutions of 1848 (and, incidentally, not long after the News of the World first went to print). The Liberal opposition to the Monarchy, realising the need to mobilise popular support, turned to the Camorristi whom they saw as the leaders of the Neapolitan poor, and formalised the agreement through systematic bribery. In effect the extorters of the poor were able to sell their power to the political elite, thus positioning themselves as indispensable power brokers. Those who see Rupert Murdoch as a right-wing ideologue intent on destroying welfare states, cutting taxes for the rich and launching neocolonial wars credit him with a utopian vision that he has never possessed, and overlook the political flexibility and business acumen that are the true source of his power. Murdoch himself has strong political leanings (many of which are about as far to the right as Genghis Khan’s,) but he would never let these get in the way of the role of power broker that he has carefully positioned himself into. He does not have a vision of a perfect society and can therefore casually mirror the swings of public mood, sometimes leading, sometimes following, but always shaping the debate for optimal impact. The Mail and Telegraph groups, weighed down by cultural and ideological baggage, should be so lucky. It is a particular set of social and cultural conditions that have permitted his particular organisational model and business strategy to succeed so spectacularly, of which three are paramount. Firstly, Britain’s working classes have split along occupational lines. A shrinking number of manual workers and a fairly stable (since the 1980s) number of long-term unemployed, have been eclipsed by a large and increasingly diverse service class. This group spans the public and private sectors, varying income levels and job roles, and different living circumstances (for example between homeowners and social housing tenants.) At the same time there has been a decline in regional differences (although not identities) with the onset of national broadcasting and increased mobility. The Sun and News of the World (not to mention Sky Sports,) were very much designed to cater to - and mould - the tastes of a national, post-industrial working class. Secondly, this changing class constellation has been accompanied by a general decline in class deference. This was born of the cultural radicalism of the 1960s, but has continued apace and expanded beyond the original vanguard of predominantly middle-class students to all sections of society. Despite a dramatic rise in inequality since the 1980s political radicalism within the working classes has retreated along with the manual trades. Instead, declining working-class deference has manifested (with the guiding hand of Murdoch and others) in a seething cultural resentment against a perceived metropolitan elite. The greater social and economic liberalism of the urban middle class and political elites is offset against an often more socially conservative working class, which - at least until now - has also been more vulnerable to the whims of the global free market. It was this tension that Murdoch was able to exploit to his own (and almost no one else’s) advantage. A third key condition is the changing nature of news and our understanding of it. Television offered a more visual and emotional representation of events, which the print media, if it was to maintain its relevance, needed to adapt to. Out of the shrinking margins of newspaper sales, particularly for the tabloids where advertising revenues are notoriously low, a new business model was born. They sought to maximise sales through sensationalistic, and personality-based coverage of news, and eventually more or less abandoning news altogether in favour of idle gossip. Murdoch was simply the most successful and politically canny of several proprietors who took this path. These three conditions are in flux and may not settle in a way that is favourable to Murdoch or aspiring Murdochs, dynastic or otherwise. As Ken Goldstein explores, newspaper margins are sinking beyond the point where scandal and sensation remain profitable. Indeed the depths to which News International (and in all likelihood other tabloid groups) have sunk is probably a symptom of a slow and undignified demise. A less concentrated and more chaotic online media, somewhat anchored by heavily regulated broadcasters and those newspapers that can become sustainable (or sustained), is likely to emerge. In this more fractured ecosystem individual organisations will probably not be able to manipulate mass opinion in the way that Murdoch has in the past. However, the human instinct for the witch hunt, which Murdoch once harnesssed but now finds himself the victim of, will continue. It will arise from more diverse sources, and occur less predictably but with equal ferocity via Facebook and Twitter. The other question surrounds where the politics will go. There will be no return of deference nor of old-fashioned working-class radicalism, no matter how much Maurice Glasman and his Blue Labour movement, covered in depth on OurKingdom, would like it to. It also does not seem likely that the cultural resentment that has replaced older forms of class conflict will dissipate any time soon. Britain’s class divisions seem to run too deep to address the real causes of this: educational apartheid, polarised housing and labour markets and an individualistic culture, fuelled in part by consumerism and the cult of celebrity, which News International has contributed to but which can survive quite happily without it. The latter’s power is to hold individuals responsible for their personal successes and failures without seriously attempting to level the playing field, let alone narrow the outcomes. The greatest hope in overcoming this seemingly unbridgeable gulf lies in the excesses of the class to whom Murdoch actually belongs. The wealthiest and most influential people in Britain, much like the Camorra, are rarely seen in the newspapers. It only happens (as for Murdoch now and for the bankers in late 2008), when they are in crisis. Ironically, despite the money that has been lost to the taxpayer via the bank bailouts and tax avoidance and evasion by the wealthy, both the middle and working classes have largely let the super rich off the hook. As it dawns on them over the coming decade of austerity quite how much of their wealth has been stolen a basis may emerge for a broad coalition to challenge today’s most important political division - that between the carefree financial speculators and their wealthy corporate accomplices, and everyone else. Such a development would require finding a way of moving beyond Britain’s entrenched class divisions - the inequalities of the past as they have been fossilised in our language, culture and institutions - and actually addressing the real key inequality of the present. For a period in the 1970s a powerful Camorra boss was temporarily able to unite the clans under his rule, but before long conflict broke out and it splintered into several smaller, but equally deadly groups. The Camorra’s organisational structure may have changed over the years, but the underlying dynamic of extortionary patronage of the poor has remained intact since 1848. That is Naples’ inheritance. Ours is a culturally and politically stifling system of class resentment, mutual suspicion and lack of basic empathy. Unless we can find a way to liberate ourselves from it, for each of the Hydra’s heads we decapitate ten more will grow.